In 2012, Dame Judi Dench revealed that she was beginning to lose her sight due to a condition called macular degeneration. 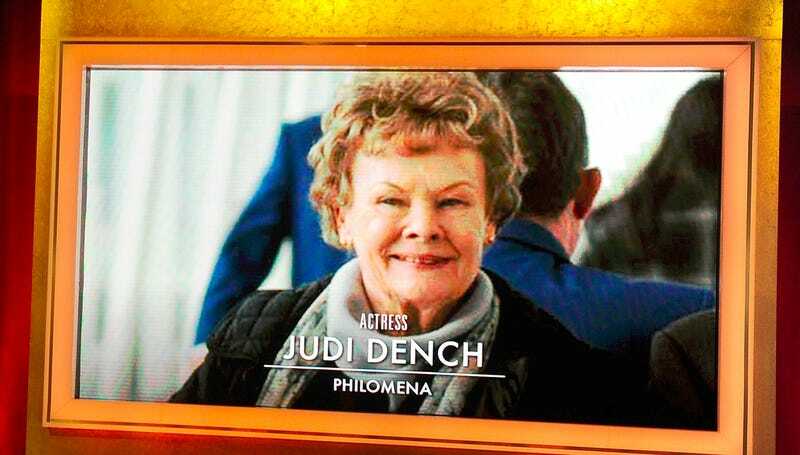 Apparently her eyesight is doing so poorly that she officially can't read scripts anymore, which hasn't stopped her from taking roles she could win an Oscar for. Judi! "She can't read her own scripts so her friends have to go through them with her, or she'll learn them on a tape recorder. "There were many times during filming where her sight was a problem for her with recognising faces or objects and often someone would just jump in and help her move about so she didn't lose her footing." Judi likely doesn't need any of our sympathies; even if she does decide to show up for the Academy Awards to give another understated and classy speech, all she wants is for critics to recognize the glory that was The Best Exotic Marigold Hotel, which apparently did very well at the box office. I watched that movie alone one Friday night with a few glasses of white wine and I can attest that it is surprisingly delightful. And though I have never felt more elderly in my life than I did that evening, who cares about age, when one can age like Dame Judi.